All signs indicate that ‘Venus’ is going to be an extremely successful introduction that will yield North Carolina growers substantial returns. National sales could potentially reach 100,000 to 200,000 units per year. At a wholesale value of $12.50 per plant, annual sales could exceed $2,500,000. Retail value would be twice that amount. 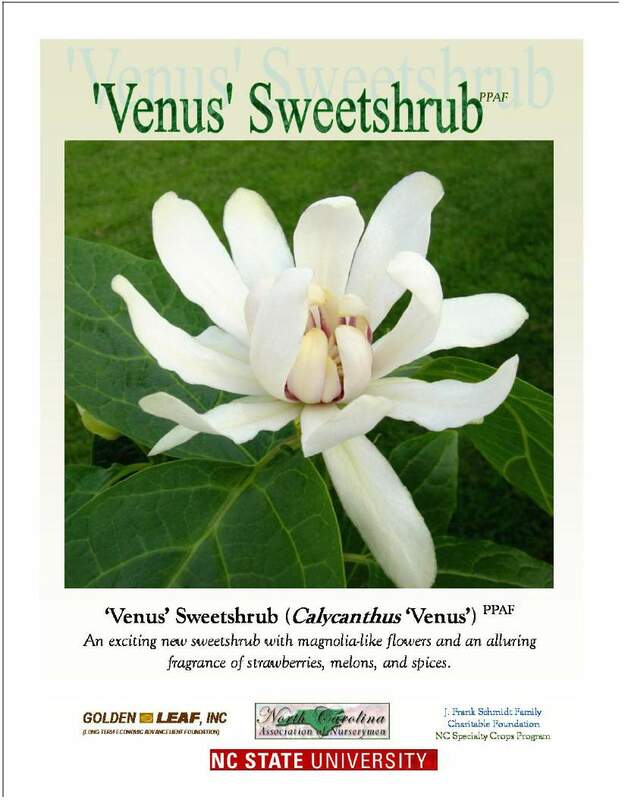 There are currently 12 nurseries in North Carolina trialing/producing ‘Venus’. More companies will be impacted as plants move into re-wholesale, garden center, and landscape contracting markets. Initial sales should begin in 2004. Efforts are also underway to establish markets in Europe, Japan, Australia, and New Zealand. ‘Venus’ is an extremely promising new nursery crop that was developed at NC State with support from the North Carolina Association of Nurserymen, The Golden LEAF Foundation, and the J. Frank Schmidt Family Charitable Foundation. 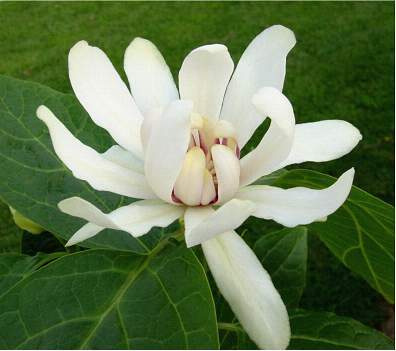 This cultivar is an advanced hybrid that has demonstrated excellent adaptability, pest resistance, stress tolerance and exhibits exceptional ornamental features that transcend what has previously been found in sweetshurbs (Figure 1.). ‘Venus’ represents a considerable breakthrough – there is nothing else even remotely similar in the market. Although ‘Venus’ looks very promising, we needed to develop and refine propagation protocols, develop specific production practices, and propagate stock plants for distribution to growers and for regional trials. Promotional materials needed to be developed and marketing efforts needed to be initiated. Establish a propagation stock block at the MHCRS for use by NC Nurserymen. Develop promotional materials and market through trade magazines and industry meetings. Propagation studies were conducted to optimize and refine production protocols. Summer, sub-terminal cuttings were evaluated for rooting potential following treatment of the basal 1” of the cutting, for 5 sec., with a range of auxin (potassium form of indole-3-butyric acid dissolved in water) concentrations. Production demonstrations were developed for tours and field days. A stock block of ‘Venus’ was established to provide North Carolina growers with a source of propagation material. Plants were propagated and distributed to growers. On-farm trials were established with growers across the State. Propagation. Propagation studies found that ‘Venus’ can be produced by summer stem cuttings with the use of supplemental auxin treaments. 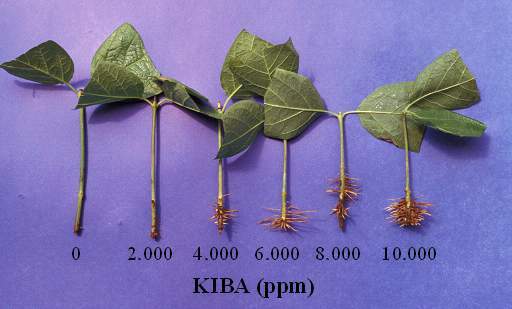 Rooting increased from 50% with no treatment to 100% when treated with KIBA at concentrations of 4,000 to 10,0000 ppm (Fig. 2). 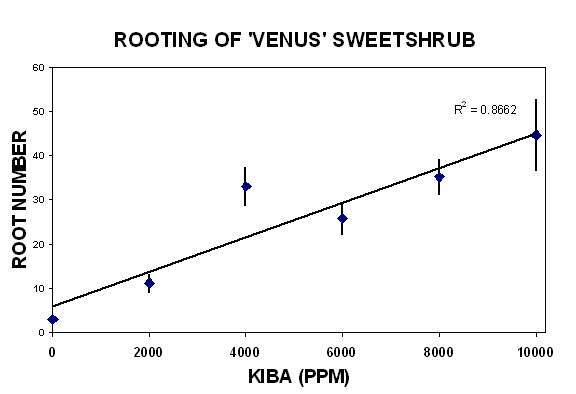 Root number increased linearly with increasing auxin treatment and ranged from approximately 6 roots per cutting for no treatment to over 40 roots per cutting when treated with 10,000 ppm KIBA (Fig. 3). 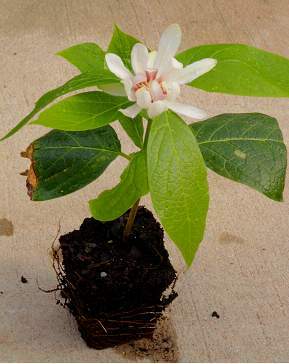 Cuttings develop a strong root system and often bloom after rooting (Fig. 4 and 5). 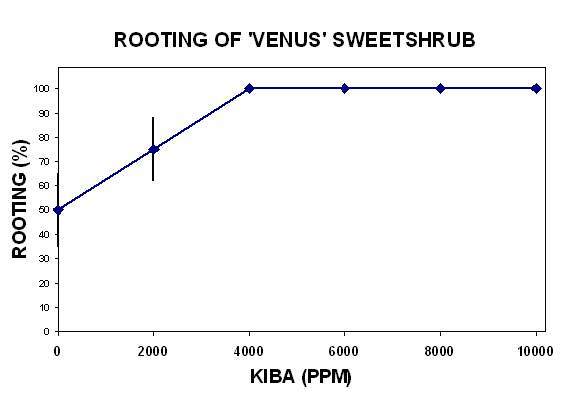 Our current recommendations are to propagate ‘Venus’ using 2-node (strip bottom pair of leaves), firm, subterminal cuttings and treat the basal 1” with 8,000 – 10,000 ppm of KIBA dissolved in water, and place cuttings under periodic mist. Cuttings can be stuck in large celled flats or directly into quart pots with a well drained medium. Stock block. A stock block of 50 ‘Venus’ shrubs has been established at the Mountain Horticultural Crops Research Station. These plants will be available as a source for propagation material for North Carolina nurseries. Promotional materials. Images and slides of ‘Venus’ have been distributed and are available upon request. Posters and flyers have been developed and distributed to producers (Fig. 6). Figure 1. 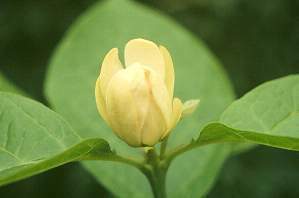 ‘Venus’ Sweetshrub PPAF – in flower and bud. Figure 2. Rooting percentage as a function of auxin treatment (potassium form dissolved in water). Symbols are means, n=12, &plumn; 1 SEM.